Make sure different vendors can work together—personalities and equipment. Gain an understanding of the information that they need. Discuss any logistic and packing issues with each vendor. How do they expect to receive the pieces? Does the piece conform to postal regulations? Includes wafer seals, orientation of mailing panel, address area. Does the piece qualify for the postage class that you would like to mail it in? Both weight and size? A paper dummy is a mock up of the actual piece on the actual stock that will be used. The stock will normally be unprinted at this point. Weigh it to get a postage amount, but don’t forget to add a few more tenths of an ounce for ink. Show it to all necessary parties involved internally and to the vendors. Determine if the paper is appropriate in relation to your branded image. Send one to yourself through the USPS to see what it’s going to look like when it lands in the mailbox. Use it to determine how the pieces inside the envelope will collate. Useful for testing purposes and specifics like folding, what’s facing out when the envelope gets open, etc. What type of equipment do they have? What is the size of the equipment? Take a tour of the facility. Give as much information about the project and your expectations as possible, then sit back and be open to suggestions and comments from the vendors. Does the printer suggest a house stock that is comparable to one you would like to use? House stocks are paper purchased at truck load prices to pass on savings to the customer. Each printer has a different list of house stocks available. Know the necessary format for the mailing list file and any personalization that might take place. Ask for a sample of the lasering or personalization. Some printers have limited fonts that they can use on addressing. 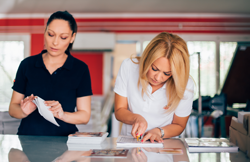 Ask about Ancillary Service Endorsements that are available for your mailing. Ancillary Service Endorsements examples are “Return Service Requested” “Address Forwarding Requested” Make sure you understand the charges associated with each. While these are useful to help cleanse your database, they can also be costly if not done correctly.